I am a Partner and Head of the Family Department at David Gray Solicitors. I am a specialist family lawyer and have worked in family law since I qualified as a Solicitor in 2001. I am ranked in Chambers and Partners and am also named in the Legal 500. I have many years of experience in dealing with the breakdown of all types of relationships and the issues that arise from this including divorce and dissolution of civil partnerships, arrangements for children, injunctions and financial issues. I am also a skilled advocate, experienced in representing clients in Court. 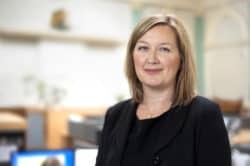 I am a member of the Law Society Children Panel and am a Resolution accredited specialist in the areas of Financial Provision, Cohabitation Breakdown and Domestic Abuse. As a Higher Rights Advocate, I represent my clients at all levels of the Single Family Court. I am also a qualified Family Arbitrator and a member of the Chartered Institute of Arbitrators (CIArb).